The predicted rainfall amounts in northeast Iowa for the next 24 hours could hit two inches in some locations. While a Tuesday morning severe thunderstorm brought large hail and significant winds to north Iowa, more rain looks to be on the horizon. Related: Large Hail falls around north Iowa. The predicted rainfall amounts in northeast Iowa for the next 24 hours could hit two inches in places like Decorah. Around 1.62 inches is predicted in Charles City, 1.51 inches in Clarion with locations like Austin, Forest City, Mason City and Rochester ranging between .5 inches to an inch. It’s been an active two days in the weather department. It began Sunday night into Monday when severe storms knocked out power and knocked over trees in and around Sheffield. Thunderstorms knocked over trees in southern Minnesota on Monday night. 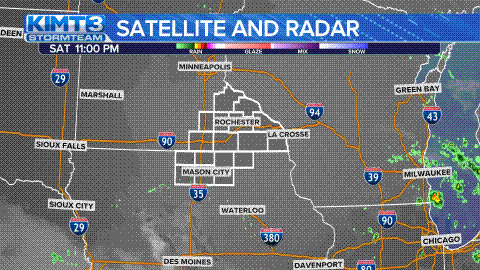 Severe thunderstorms were prevalent again across north Iowa Tuesday morning with significant hail being reported across many north Iowa counties. Severe Thunderstorm Watch issued until 9 p.m.